The photos alone are worth the effort of these group Halloween costumes – like this modern day Little Red Riding Hood and Wolf couple’s costume. You’ll obviously be spending Halloween with your best buds and/or your significant other so why not talk to your pals about collaborating on a super sweet group costume? The photos alone are worth the effort and, with so many great options, your friends are sure to be ready to jump on the bandwagon. 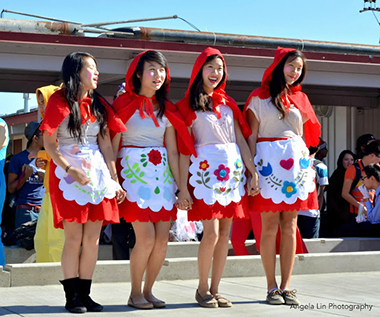 Check out some of these great group costume ideas – starting with costume ideas for two. 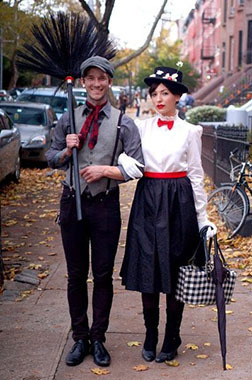 There’s only one word to describe this costume duo and its supercalifragilistic expialidocious! 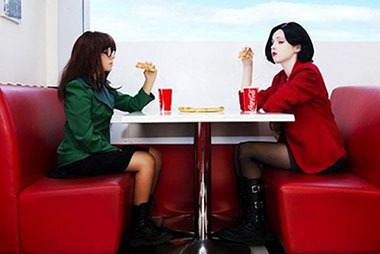 Get animated…or lack thereof (yes, technically they are animated characters who don’t act so animated in life) and embrace the sick sad world of Daria Morgendorffer and her best bud Jane Lane. The costumes are simple, fun and you get to have a constant annoyed expression on your face, which is a bonus. 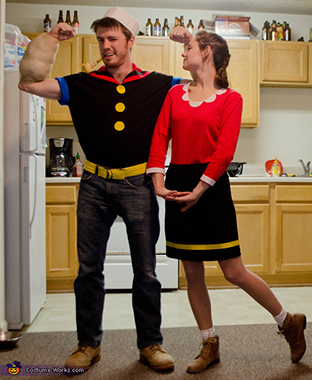 Dress up as everyone’s favorite dynamic duo: the spinach-loving sailor and the lovely lady he only had eyes for. Don’t forget to take a can of spinach along! Party on! 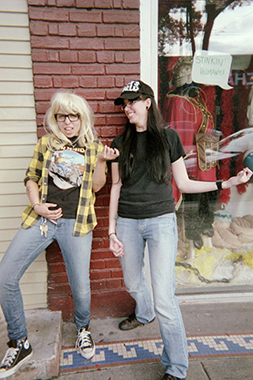 Dress up as Wayne and Garth to embrace your inner dudes – imagine how fun it would be to totally take on their personas for an entire night. Sh’yeah! 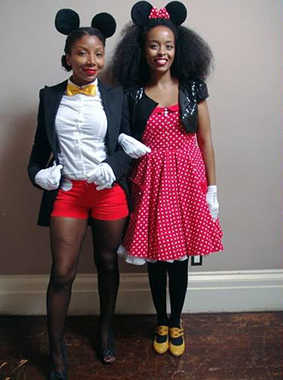 What could be cuter than dressing up as beloved classic characters Mickey and Minnie Mouse? It doesn’t matter if you’re a guy and a girl or both girls (see photo) – the possibilities of creating your own adorable look are endless. Combine your love for Ellen and all things adorable by dressing up as two of her favorite little guests of The Ellen DeGeneres Show this year. Sassy attitude required. 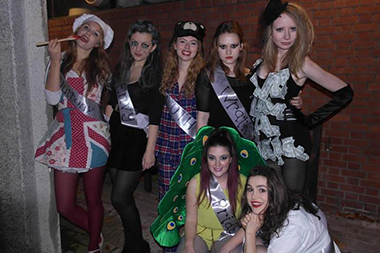 Want a Halloween costume that’s chic and creative at the same time? 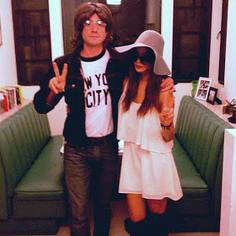 Try dressing up as an iconic couple, like Lennon and Yoko. Bonus: you can likely use items from your closets to create the costume and craft your own “peace” sign. Costumes so adorable everyone will want to eat you right up! 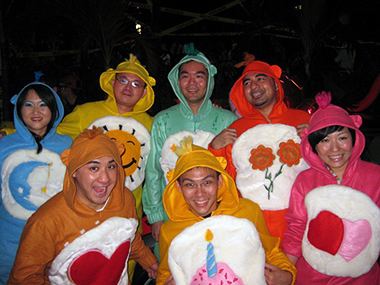 Go as a group or alone, it doesn’t get much better than these creative and fun fruit costumes. Not into fruit? 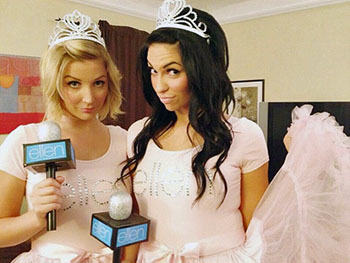 Check out the rest of Studio DIY’s DIY Halloween costumes. They’re oh-so-clever and fun – you’re sure to find one you love! Images courtesy of Studio DIY. 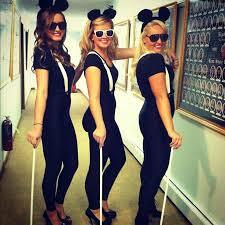 Everyone knows the macabre English nursery rhyme, Three Blind Mice, but did you know it makes for a darling costume for three, too? Girls, guys or a combo, your adaptation on these critters is sure to be a hit! Winter, spring, summer, and fall are distinct seasons that everyone is able to easily recognize which makes it even easier for you to recreate. 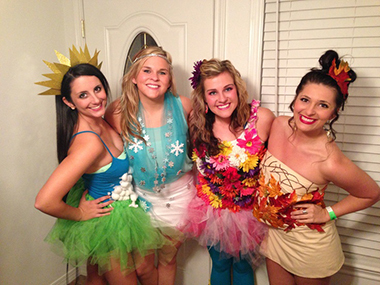 Gather three of your pals and embrace the seasons in this awesome creative costume for four. 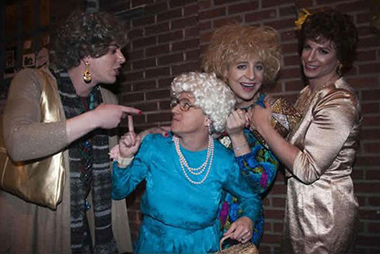 Your friends will thank you for being a friend when you suggest dressing up as the four spunky gals everyone knows and loves. Mega points for the guys who take this on! 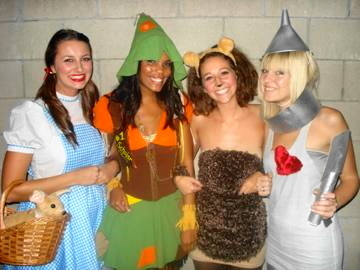 While there are four main characters in The Wizard of Oz, you could expand this costume theme to add on Toto, The Wicked Witch of the West, Glinda the Good Witch, Flying Monkeys, The Great and Powerful Oz and Munchkins of Munchkinland. What better way to embrace the hilarious differences in stature between friends than by personifying these delightful childhood trinkets? Plan to wear shoes with varying heel heights to play up your height differences for some added charm. 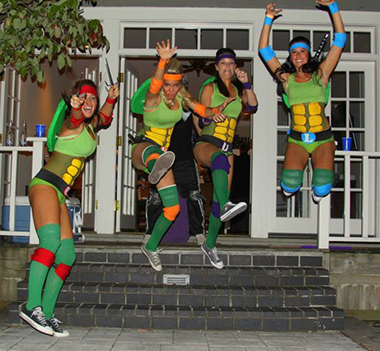 The benefits of wearing a TMNT costume: You have a reason to scream “Cowabunga!” at everyone. You have an excuse to carry around/eat pizza all night long. You get to show off your sweet ninjutsu moves. None of these seem like bad things. Image courtesy of Follow pics.co. It’s time to spice up your life, just saying. And becoming an outlandish British pop star for a night is just the trick. Plus, you already know all the words to the Spice Girls tracks. Don’t lie, we know you do. 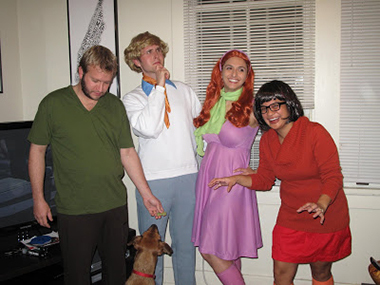 If there’s ever a time to get the gang together to solve a mystery, it’s on Halloween. We also recommend packing some Scooby snacks because, well, you never know. 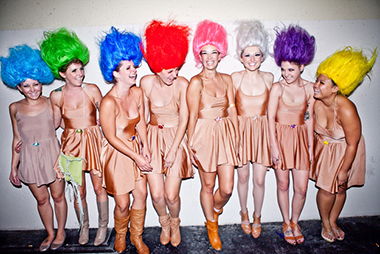 A costume that could have easily gone awry, this take on the classic troll doll is charming, whimsical and, best of all, tasteful. 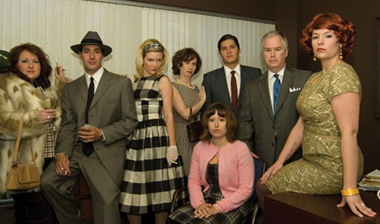 Go old school with your group and shop in your grandparent’s attic or vintage stores to capture the essence of the Mad Men character’s style and glamour. It’s perfect for a group with the varied character looks and you can have fun putting the costumes together – don’t forget to adopt your character’s unique persona, which is half the fun! Capture the essence of the five members of the family that everyone loves. BONUS! Take along all the delicious burgers your heart desires! What could be better than that? 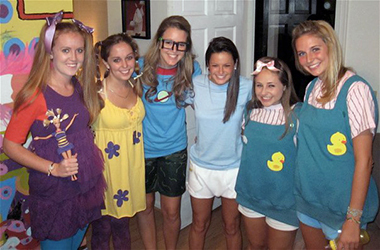 Create your own adventure an lá Rugrats style this Halloween by channeling your inner baby. Don’t forget to bring Spike along, either! 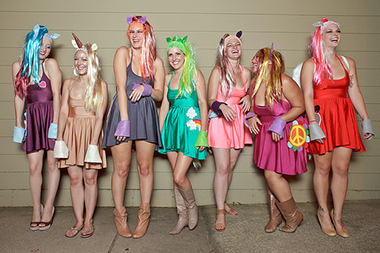 Frolic the night away with an irresistible take on everyone’s favorite ponies that gushed with glamour. 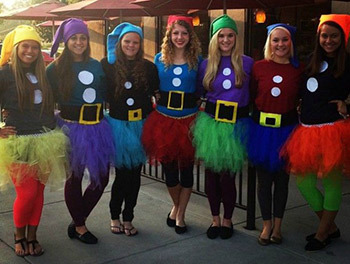 Colorful and sparkly, these costumes are eye-catching and perfect for the occasion! Sure to be a popular costume this year, dress as everyone’s favorite inmates on the hit Netflix series, Orange Is the New Black. 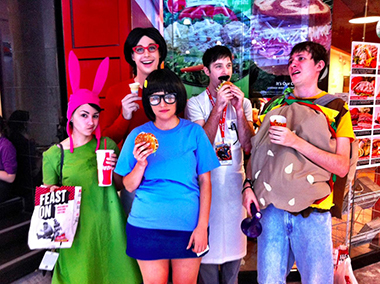 The great thing about this group costume is there’s a huge cast of characters to choose from so no friends will be left out. Even though the inmates are women, there are male security guards so guy friends can join in on the costume, too! 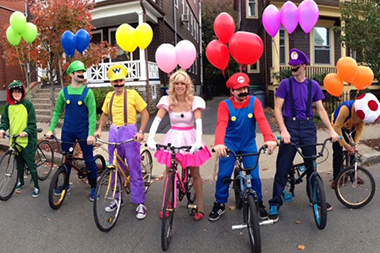 With a total of 30 characters to choose from, everyone in your group will find a costume they adore in the Mario Kart lineup. Who doesn’t want to be a Disney princess? Some people. Some want to be a Disney villain. 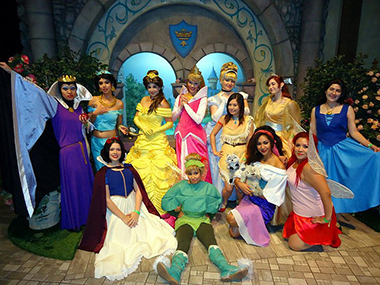 Whatever floats your boat, you and your friends can dress up as the Disney characters, because there’s something for everyone (Don’t forget that there are Disney princess, male villains and other characters, too!). 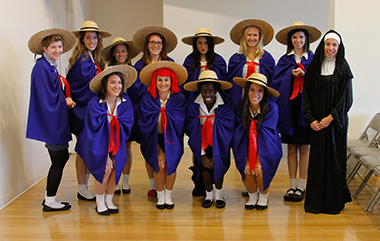 Bring the beloved Madeline series to life, dressing up as the infamous little girls from Madeline’s boarding school. Props to the friend who takes one for the team and dresses up as the school’s teacher, the nun. We vote it’s a guy friend of the group. 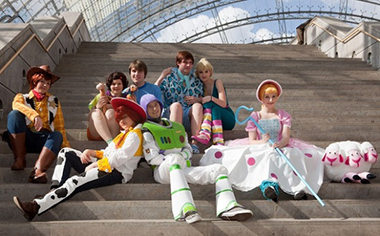 Help your favorite Toy Story characters come to life, just as they do in the popular films, on Halloween. There are countless characters to choose from so nobody gets left out of the group, either. Find a bear to suit your personality – whatever your mood. Simple choose a bear, get a hoodie in that color and create a graphic that’s on that bear’s stomach. Simpler than you thought, right? 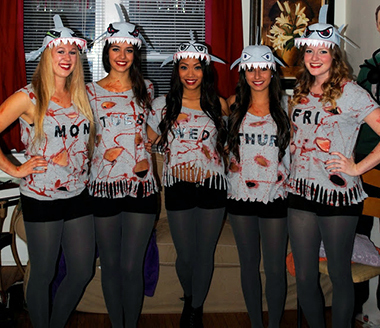 We all live for Shark Week. Become the hero that makes it happen twice this year by organizing your very own recreation with friends. Put your spin on the seven deadly sins by creating a look that demonstrates each in action. MEGA bonus points for keeping the costumes on the classier side (you know what we’re talking about). Grab seven of your buddies (you’re sure to have one that’s happy, sleepy, bashful and so on…) and dress up and everyone’s favorite forest dwelling dwarfs. Need an eighth or ninth? Don’t forget about Snow White and the Evil Queen!